The motive of passing the Act was the prevention of distress sales, including inter-community social distress sales. However, for three decades, it has been used to drive Muslim residents away from areas that have a mixed population. Ahmedabad: Vishwa Hindu Parishad leader Pravin Togadia in a speech in 2014 at Bhavnagar, Gujarat, had suggested spitting on a Muslim man and throwing tomatoes at him. This, while attending to a complaint reportedly about a Muslim man who had bought a property in a ‘Hindu area’. Evoking the Disturbed Area Act in his speech, Togadia had stated, “This is a long-time conspiracy that Muslims have been executing in cities and villages of India. How can we stop this? There are two ways – one, to impose Disturbed Areas Act everywhere, two – consult a lawyer, barge into a house, occupy it forcefully and hang the board of Bajrang Dal. We can handle a case later.” His audience had cheered and clapped. The Disturbed Areas Act was enacted in the year 1986 and replaced with a new Act in 1991. It empowers the government to declare riot-prone areas as ‘disturbed’. Property sale or transfer in areas where the Act has been imposed requires additional permission from the collector’s office affirming free consent. The motive of the Act was to prevent distress sales. It was also to prevent house owners of one community from selling to another in case of social distress. However, for three decades, the implementation of the act has translated into a very different ground scenario. Evoking the Act to drive Muslims residents away from areas that have a mixed population is not uncommon in Gujarat. Munir Sheikh was an employee of Life Insurance Corporation (LIC) when he bought a flat in Paldi, Ahmedabad in 1995 – a house where Sheikh and his family could never live in and eventually had to sell. “I took a loan from LIC to buy a flat in Paldi in 1995, an area dominated by the Jain community. There were six families in the building, out of which two were Muslims, including ours. Four families were Hindus and weren’t happy to have Muslim neighbours. Haren Pandya, an influential BJP leader of the area who used to be corporator then and was aspiring to fight assembly election from the constituency found an issue. At the behest of Pandya, a case was filed against me, evoking the Disturbed Areas Act. In the lower court, they stated that they fear if I buy the flat, more Muslims will come and eventually take over the area. They tried to prove that I was dangerous. The registrar who was also a Jain, gave a statement against me. I was asked by the lower court to vacate and move elsewhere. But I appealed in High Court,” Munir Sheikh, now retired, told The Wire. The case went on for four years. During this time, Sheikh could not live in the house he had bought and was constantly under pressure and threats. “They attacked my house and even tried to set it on fire once. All the Hindus and Jains of the area boycotted us. We could never go there and live, my family was scared. Besides, the police never took my complaint. The case lasted four years – all the while I was pressurised by men from BJP, RSS and even the police,” added Sheikh. The only respite for Sheikh came from Gujarat high court, which ruled that the flat doesn’t fall under the Disturbed Areas Act and asked police to provide protection to his family. “My family was too scared to step into that flat. We sold it as soon as I won the case,” tells Sheikh. In April this year, there were reportedly complaints from a local outfit called Nagrik Sewa Samiti in Paldi, Ahmedabad, which sought to reclaim a housing society – Varsha Apartments – allegedly ‘taken over’ by Muslims. Chief minister Vijay Rupani ordered to review the Act and plug the loopholes. The meeting was attended by Pradipsinh Jadeja, minister of state for home and other officials of state revenue and home departments. Nagrik Sewa Samiti, that was formed about three years ago, is a part of Hindu Jagran Manch, a Hindu activist organisation affiliated to Vishwa Hindu Parishad (VHP). “The society was built in the year 1969 under Jan Kalyan Cooperative Housing Society and Hindus used to live there. In 1991, one Muslim family bought a flat in the society. By 1995, out of 24 flats, 20 were sold to Muslims. They started redevelopment work of the flat in the year 2013. It used to be a two-storeyed building, but it is now a seven-storeyed building. They started redevelopment work again six months ago. There will be 125 flats that will be taken over by Muslims. We filed an RTI and found that the builder has sought permission under Disturbed Areas Act in one document. Another document stated that the building doesn’t fall into an area where the Act is imposed. We went to concerned authorities and asked them to intervene,” Jigar Upadhyay, one of the founders of Nagrik Sewa Samiti and member of Hindu Jagran Manch told The Wire. “Just like love jihad, there is something Muslims also practice – land jihad. It is a well-planned conspiracy to take over the areas where non-Muslims reside. First, they buy one flat at a higher rate than market value and keep buying properties in the area/building. Before one knows, the last residential property owned by non-Muslim is devalued and sold for peanuts because it isn’t safe for the family to live there anymore,” continued Upadhyay. “Muslims should stay in certain restricted areas of the city and let non-Muslims live peacefully and safely elsewhere. The whole point of the Disturbed Areas Act is to ensure this safety.”. Varsha Apartments, a cooperative society registered in 1969, originally had 24 flats. All the members of these flats were members of the cooperative society. After 35 years, the contract of redeveloping the dilapidated flats was given to two Muslim builders. Along with original 24 flats, an additional 38 were to be built as a part of redevelopment. “Due to the lack of clarity about the inclusion of Varsha Apartments in the Disturbed Areas Act, we were initially given permission and documents were registered by the district sub-registrar without insisting for any pre-permission under the Act. Subsequently, the authorities realised that the flat does fall under the Act. Thereafter, permission was sought and granted under the Disturbed Areas Act. Later, two men named Apoorv Shashtri and Jigar Upadhyay identified themselves as social workers and raised objection. These people associated with Hindu Jagran Manch are in no way related to the property. They don’t even live near Varsha Apartments. Yet they have expressed their concern about the flat before every concerned authority including the office of the chief minister. Everywhere, they are being heard and entertained. They keep repeating that we are indulging in land jihad and that Paldi shouldn’t turn into Juhapura (an urban Muslim ghetto in Ahmedabad). They have been distributing pamphlets and instigating people who live near Varsha Apartment and pressuring officials of Ahmedabad Municipal Corporation and Collectors office,” said Ruknuddin Sheikh, one of the builders of Varsha Apartments. 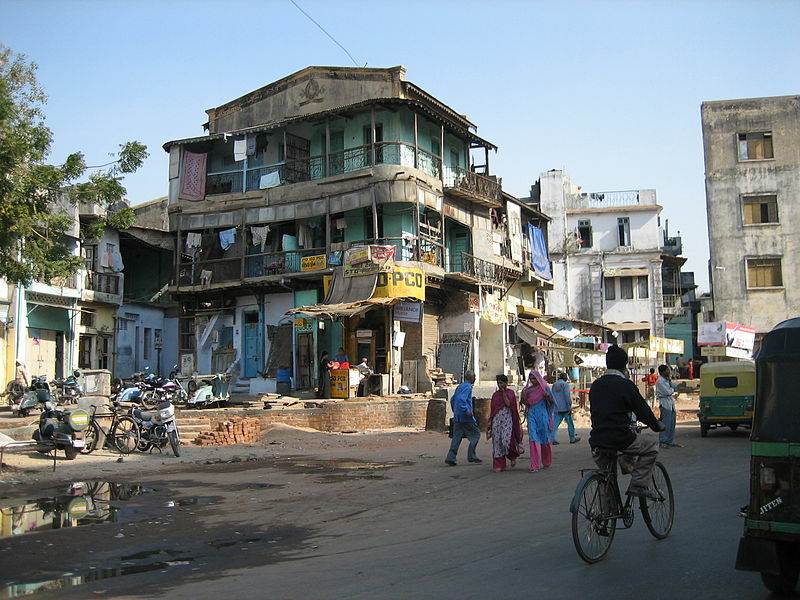 “For every society that is built for residing Muslims, there are at least 200 built for residing Hindus in Ahmedabad. In fact, Muslims have been selling off their properties in Paldi and settling in Muslims dominated areas like Juhapura and Jamalpur for safety. There are apartments like Liberty, Seven Heaven and Paradise in Paldi area which once used to be the abode of Muslim families who sold off houses gradually after riots of 1985, 1992 and 2002. Hindu families reside in those apartments now,” added Ruknuddin. 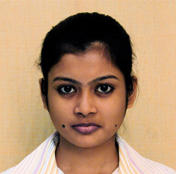 The case of Varsha Apartment has been sub-judice for one and half years now. Despite no concern raised by either seller or buyer, regular protests have been organised under Nagrik Sewa Samiti, a third party. To add to that, various posters stating ‘Don’t let Paldi become Juhapura’, ‘Stop Land Jihad’, ‘Hindu Ekta Zindabad, ‘Implement Disturbed Area Act Strictly’ etc have been put on public walls and gates of different societies several times. 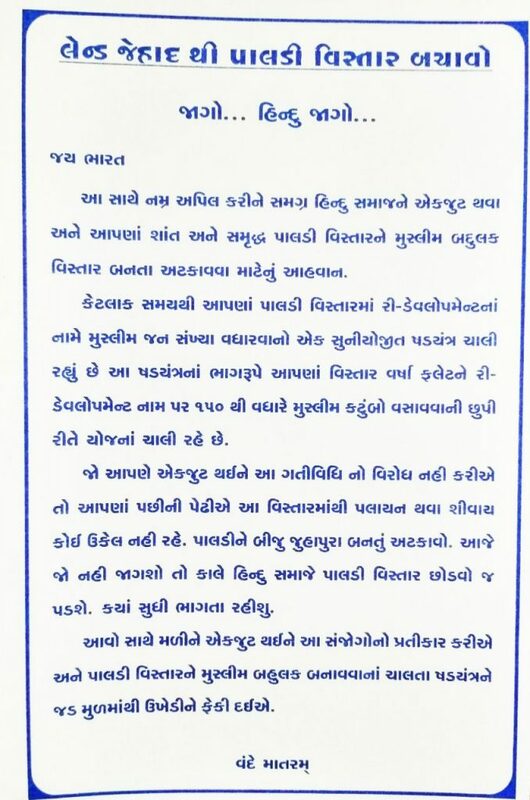 A pamphlet distributed by Hindu Right Wing activists in Paldi area, Ahmedabad against redevelopment of Varsha Apartments. This is an humble appeal to Hindu community to unite and make sure that our peaceful Paldi area does not turn into one populated (taken over) by Muslims. For sometime now, there has been a conspitorial attempt to increase the number of Muslim families in our area through guise of redvelopment. There is an attempt to inject 150 Muslim families into Varsha Flats in our neighbourhood in a hidden manner through this redevelopment project. If we donot unite and protest now, our decendants will have no option but to leave this area. Stop Paldi from becoming another Juhapura. If we dont rise up now, Hindus will have to leave Paldi tomorrow. How long can we just run away? Come rise and let us stop Paldi from becoming a Muslim majority area. Let us destroy this conspiracy from its very roots. “I had bought a property in Jamalpur 20 years ago. In all these years, I haven’t been able to transfer the house in my name. Despite paying for the property I had to settle for power of attorney signed by the seller due to the Act,” says a Muslim resident of Ahmedabad, on condition of anonymity. In many cases, right-wing elements have threatened the buyer and bought the property at meagre prices only to sell it themselves later. “If a Hindu wants to sell his property to Muslim, the right-wing elements will first ask the Hindu to not sell. If the person doesn’t agree, the anti-social elements will file an application against the person in the office of the collector. The collectorate will then deny permission evoking the Disturbed Areas Act and a plethora of problems arise thereafter. After sometime, the same elements who moved application against the seller would force him to sell at a lower price and re-sell the property later. This has become an obnoxious nexus of right wing fringe elements and government officials,” shares Sharif Mallik, an activist who works for riot victims of 2002. As of now, areas under 21 police stations in Ahmedabad alone are declared ‘disturbed’. The act was implemented in areas of Surat and Vadodara as recent as last year. In Surat it was implemented in Limbayat area at the behest of Sangeeta Patil, BJP MLA of the area. In May 2018, Disturbed Areas Act was challenged in High Court by Danish Qureshi, an activist working for minority rights. “It is a failure of the state government if there is no communal harmony in the state and such an Act is implemented. But NCRB data states that Gujarat hasn’t seen communal violence more than other states. The situation isn’t alarmingly disturbing in Gujarat. Besides, this Act violates the very rights guaranteed by the constitution and creates trouble for both Hindu and Muslim community in transaction deal of properties,” says Nishant Verma, the advocate who filed the petition. “The state government has been bringing more areas under the Act not because it is necessary but because it serves the political agenda,” stated Qureshi. “We have mentioned in our petition that a particular community has been targeted through these notifications imposing Disturbed Areas Act in certain areas. The conditions needed to impose the Act are clearly missing in these cases,” stated Kruti Shah, an Ahmedabad-based lawyer who has challenged the notification to impose Disturbed Areas Act in certain areas of Surat till the year 2021. An earlier version of the article wrongly attributed Pravin Togadia’s quote to Mohan Bhagwat. It has been corrected since. The Wire apologises for the error.